Marthe Gosteli was born in 1917 on her parents' farm in Worblaufen near Bern. During WWII she worked in the press and radio department of the Swiss Armed Forces. After the war, she was in charge of the film department of the information services at the US embassy in Bern. From the mid-1960s onwards, Ms Gosteli used her experience in the media exclusively to support the feminist movement. From 1964 to 1968, she was president of the Bernese Suffrage Society. Subsequently, she became vice president of the Union of Swiss Women's Organisations. In 1970/71, she headed the Consortium of the Swiss Women's Unions for the Political Rights of Women. This organisation's skills in negotiating with the Federal Council were instrumental in achieving the introduction of women's suffrage at federal level. Marthe Gosteli founded the Archive on the history of women in Switzerland, and in 1982, the Gosteli Foundation. She was awarded the Trudi-Schlatter Prize in 1989, received the Civil Medal from the Burgergemeinde Bern in 1992, and in 2008 she was decorated with the silver Medal of Service by the Ökonomische Gemeinnützige Gesellschaft Bern. 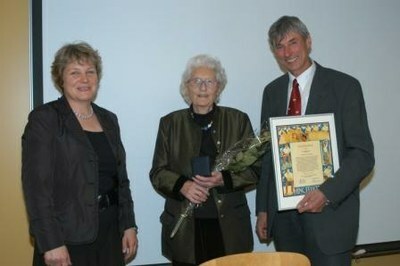 In 1995, she received an honorary doctorate from the University of Bern. Marthe Gosteli died on 7 April 2017 at the age of 99.